A good quality large breed puppy food is essential for your puppy's growth and health. Your puppy is going to grow to two thirds of his adult size by the time he reaches eight months of age. He needs just the right amount of protein to help his joints to grow, but he does not need too much protein. Too much can force his joints to grow too fast and cause irreparable damage. On this page I have tried to provide a guide to the best large breed puppy food on the market. Please feel free to click on the links and study them for yourself. 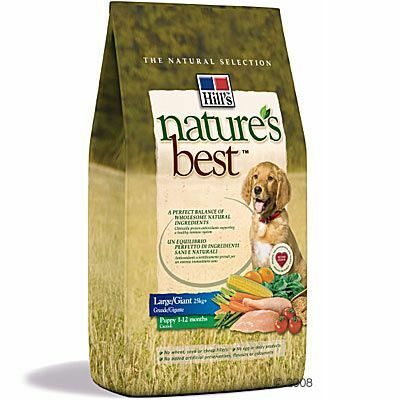 Hill's Nature's Best Canine Puppy Large/Giant is a balanced dog food for large breeds up to 1 year old. For health and wellness, stable joints and strong muscles. The Royal Canin Giant Breed puppy food is in fact what both my dogs were fed on as puppies, so I can highly recommend it. PRO PLANÂ® PUPPY LARGE BREED ROBUST with OPTISTARTÂ®* formulated with L-Carnitine in combination with appropriate protein and fat levels to compensate for the lower metabolic rate of large breed puppies and to help maintain lean body mass. Complete pet food for large breed puppies with a robust physique (over 25kg at maturity). When you collect your puppy from a good breeder, they will provide you with some of the food that he has been having. You may want to continue using the same food, or you may want to change to something else. If you do change, it must be done gradually. Introduce a small amount of the puppy's new food with his regular food. The next day, decrease the regular and increase the new, but only very slightly. It will take about a week to ten days to fully change him over to the new food, but it is important that he does not have a sudden change of food. This can cause all sorts of tummy upsets and the last thing you need is a sick puppy on your hands. I would not recommend starting the changeover immediately. Your puppy is going to be unsettled for a few days being in a strange environment and missing his littermates. It is not a good idea to change his food as well.